For detailed information on intermittently opening estuaries, see Appendix 5 and Appendix 6 of the Regional Strategy 2018. A key controlling factor of the wetlands of Southern California is the nature of their connection to the ocean, controlled by the characteristics of the tidal inlet. Tidal inlets range from permanently open, through varying degrees of intermittent opening, to closed. The frequency, timing, and duration of inlet closure will affect the elevation of water and salinity within the wetlands which, in turn, will have significant impacts on vegetation. The tidal inlet provides passage for sediment, nutrients and fish and each will be affected by the degree, timing and frequency of closure. Over the last century, many of the tidal inlets have been modified by the construction of jetties for both transportation infrastructure and flooding purposes. These modifications tended to stabilize the inlets and have maintained them in a more open condition. Restoring more natural tidal inlet conditions would help restore many of the natural functions of these wetlands and is a focus of the Regional Strategy 2018. Many of Southern California’s wetlands have, or historically had, dynamic connections with the ocean that varied seasonally reflecting annual patterns of precipitation and river discharge, as well as multi-year patterns of wet and dry years. 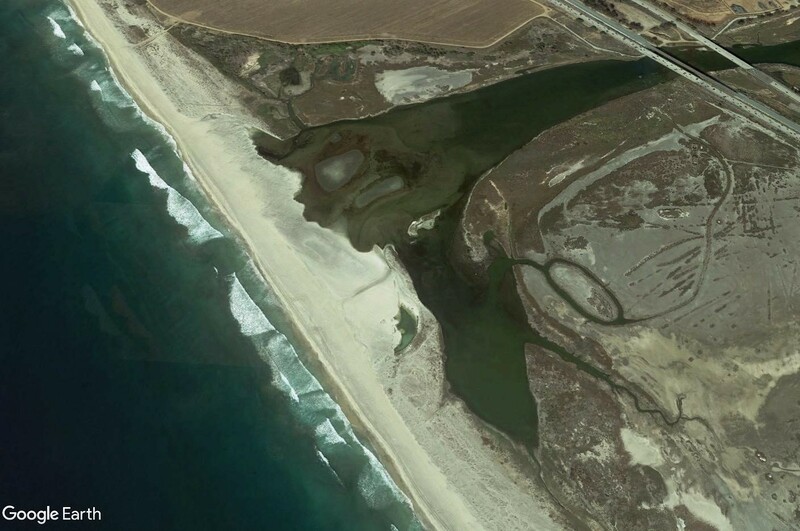 The dynamic nature of these inlets is an important characteristic of many Southern California wetlands that was captured in every archetype classification except Open Bays/Harbors. Wetlands that are defined by dynamic tidal inlets are variously referred to as Intermittently Opening Estuaries (IOE) and Bar-Built Estuaries (BBE), and in the archetype classification mostly occur in the “Intermediate Estuary” category. 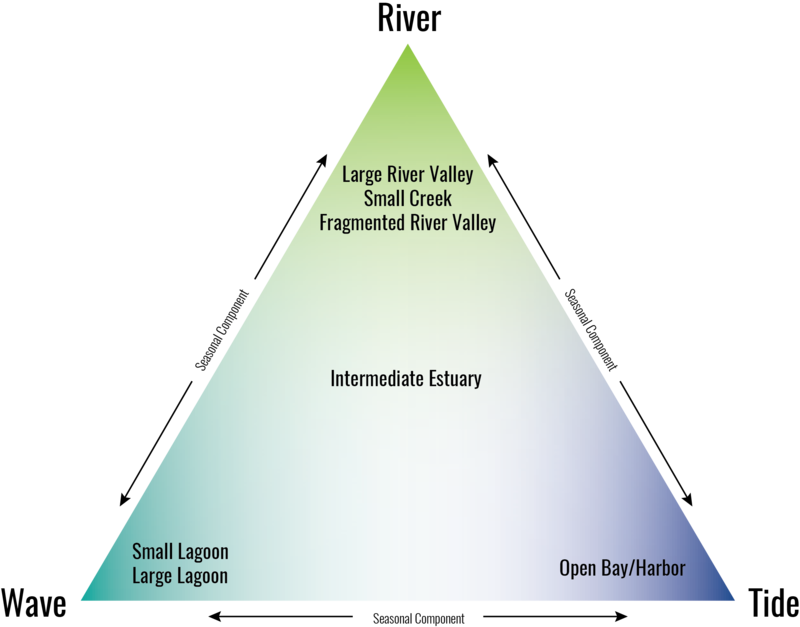 The Intermediate Estuary archetype reflects a balance between the river and wave forces on the continuum of tidal inlet conditions. All of the wetland archetypes lie on a continuum of inlet state, ranging between mainly closed to perched to mainly open, depending upon the balance of river flow to wave energy, from fluvial-dominated river mouth estuaries, to wave-dominated lagoons (Gleason et al. 2011). The tidal inlet state is also dependent upon wetland size. A Large River Valley system, where flow persists for weeks or months, is more likely to stay open and less likely to close compared to a Small Creek, which only has flow following rainfall, given the same wave exposure. Similarly, a Large Lagoon system is more likely to stay open and less likely to close compared to a small lagoon in similar circumstances. Each of the seven wetland archetypes are characterized by tidal inlet conditions that vary along a continuum between mainly closed to the ocean to always open to the ocean. This reflects the variable nature of river flow in relation to wave energy and tidal prism. The balance of forces between river flow, tides and wave energy and their effect on inlet condition is an important factor in determining wetland archetype. The tidal inlet continuum is shown in the figure above, which illustrates the dominant forcing for the system, whether it is tidal-dominated, fluvial-dominated (rivers and creeks) or wave-dominated (lagoons). The forcing factors determine where on the continuum the inlet state lies and hence the habitat types, flora, and fauna supported by each estuary (Jacobs et al. 2011). The inlet state will have significant impacts on the water quality of the estuary, dependent upon the tidal state when closing occurred and the amount of freshwater dilution from the river. Salt water may be trapped when the inlet closes, and this may lead to stratification as fresh water continues to flow over the trapped oceanic water. This trapping and stratification may increase temperature and salinity and decrease dissolved oxygen. In these systems, anoxic events may be driven more by inlet closure than by seasonality. 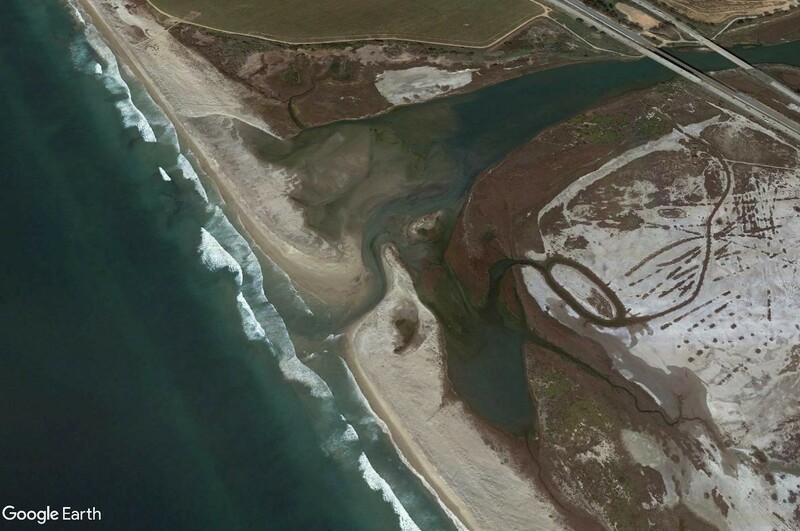 The images below show the Santa Margarita River Estuary in both it's open (left) and closed (right) states. The water level within the closed system is sensitive to the water balance driven by river flow, seepage, overtopping, and evaporation. If the system closes when the water level is relatively high, and there is subsequent river flow, then flooding may be an issue. If the system closes when the water level is relatively low during the summer when evaporation is high, then water quality may deteriorate, creating hypoxic zones and providing breeding habitat for mosquitos. The change in mean water level will also affect the inundation regime of the wetlands - the depth and duration of flooding. This shift in inundation, together with the salinity variations, will have significant impacts on wetland vegetation. The characteristics of the inlet , whether it is open, perched or closed, will affect not only the passage of water but also the passage of sediment, nutrients, and biota. Changes in the timing of closure may have significant impacts on particular species as it interacts with events in their life-history. Migration opportunities may be significantly reduced or occur at different times of the year according to the type of water year and the amount of wave energy. For instance, during a drought, the closure period may be delayed by months or even years longer and so the migration period may be shorter or unavailable. Additionally, changes in water chemistry in the estuary may limit mixing zones for salmonids to adjust from salt to fresh water, which may impose a barrier to passage even when there is not the complete physical closure of the inlet. There are benefits to inlet closure. The ecosystem within these coastal wetland systems has evolved to accommodate inherent variability and to living under stressful conditions. The accumulation of freshwater lenses may benefit many plant species, even saltwater plants. Stable conditions during closure can promote the growth of submerged plants (Riddin and Adams 2008), which may provide a foundation for epiflora and epifauna (Davies 1982) and refuge habitat for juvenile fish (Whitfield 1984) There are benefits to physical processes - fine sediment that enters the estuary during relatively small floods when it is closed is more likely to accrete rather than be flushed out to the ocean. This sediment accretion process is vital for wetlands to keep pace with sea-level rise. Higher water levels in the estuary can increase the extent of wetland habitat (Perissinotto et al. 2010). Groundwater elevations adjacent to the estuary may be elevated to a greater degree by the longer duration of high water levels in the estuary.